Friday - May 1, 2015: We had supper at Crazy Good Eats which opened today at the location which was previously first Big Bubba's Bar-BQ and later McGuire's Smokehouse in Olathe. It is operated by an extended family which has competed at regional BBQ contests as Steer Crazy BBQ. This was supposed to be a soft opening, but it was far from quiet. There was a long line and they were out of half of the items on the menu. My initial impression is mixed, but I will wait for more visits and their catching up on things before saying more. 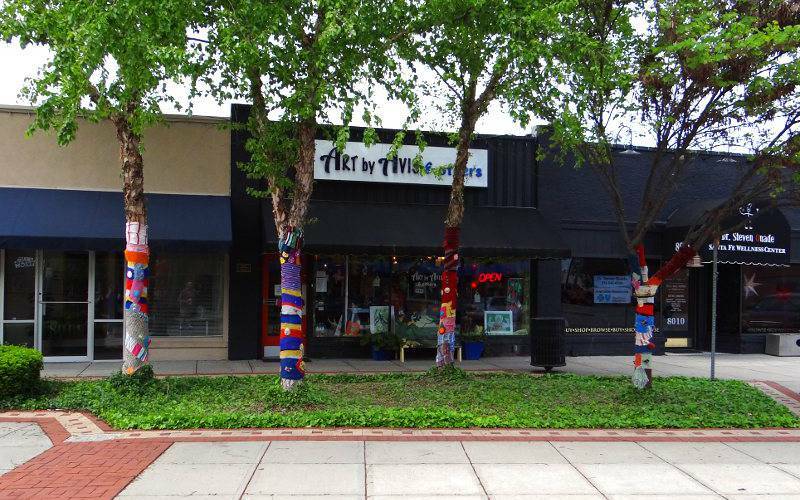 Saturday - May 2, 2015: On our way to lunch at the Snack Shack, we discovered that some of the trees in downtown Overland Park were yarn bombed late last year. It was the first time we had been to the Snack Shack on a Saturday in a very long time and I was surprised at how busy they were, with pretty much all of the seating inside and out taken. It turns out that they even have a shorter menu on Saturday, to make it easier for them to accommodate the volume of business. While leaving the neighborhood, we passed by the Tiki Heads on 79th Street, to see if they were still in place. In addition to the Easter Island style carved heads, there are now a number of found object metal sculptures. 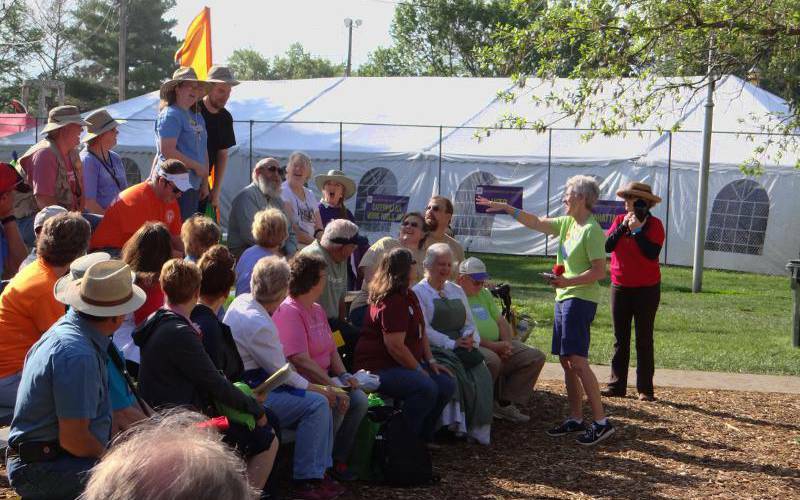 Sunday - May 3, 2015: I was up early and drove to Wamego where the 2015 Kansas Sampler Festival was being held. At 9AM the Kansas Explorers Clubs annual meeting was held and it was great seeing old friends including Wendee Laplant and Marci Penner who are the directors of the Kansas Sampler Foundation. Following the meeting, I renewed our memberships at the Sampler Foundation's web site and spent a couple of hours visiting the many booths promoting Kansas attractions and businesses. 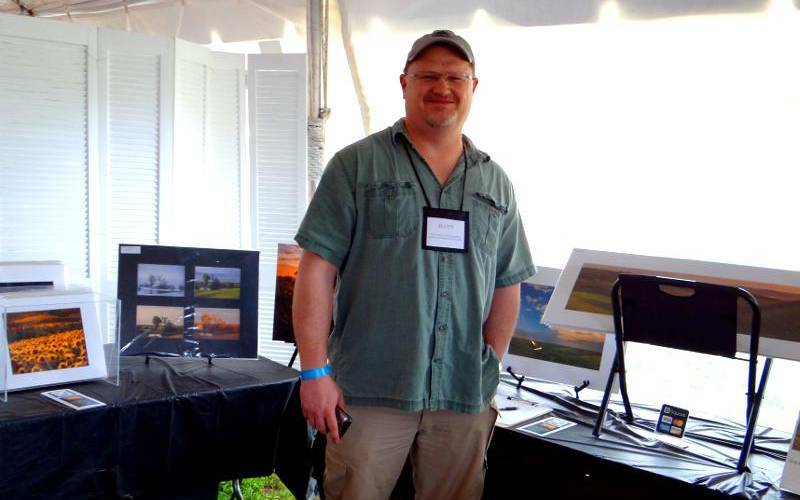 It was a treat finally meeting Scott Bean of Scott Bean Photography. I have enjoyed his work online for several years and he has also given me leads on Kansas waterfalls. Scott introduced me to another photographer, Eldon Clark, who also has Prairie Fire Grill and Catering in Minneapolis, Kansas. For lunch, I decided to investigate Fulmer's Kansas Premium Meats & Eatery, a family owned & operated meat market in Belvue. The menu was very limited and I tried a "taco burger" which was a burger with tomato, lettuce and shredded cheese. No taco seasoning or sauce. 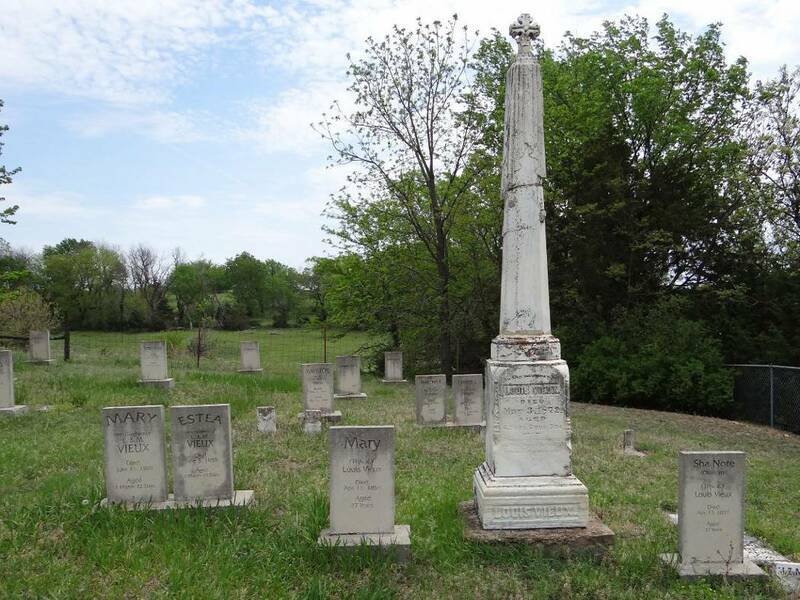 On the way to Belvue, I noticed a sign for "Historic Site - Louis Vieux Family Cemetery, Homestead and Vermilion River Crossing," and drove several miles north to find that the cemetery and homestead had been turned into a small park with a heavy metal fence, gate and picnic table in 1979. The 1850s cemetery was quite interesting. Most of the original markers are damaged or largely illegible, but they have been left in situ and newer stones with the same info added at some time. Monday - May 4, 2015: I made a second visit to the new Crazy Good Eats in Olathe for lunch. I think I am in too big a rush to try this place. There are still problems and I will give it a couple of more weeks and try them again. Friday - May 8, 2015: We took out of town family from both coasts for some Kansas exploration today. They had never seen Kansas west of Topeka and years ago we promised to take them someday. 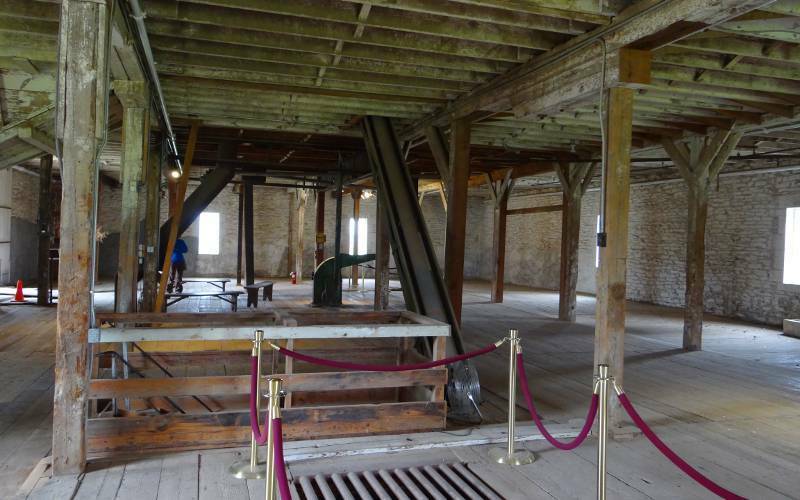 We first drove to Cottonwood Falls and Strong City, visiting the Tallgrass Prairie National Preserve, a neat old falls & bridge, and the most beautiful courthouse in Kansas. We had lunch at Ad Astra, a restaurant that is only open on the weekends and bills itself as a progressive home style restaurant. The food was even better than I remembered and everyone seemed impressed. We split a pair of large starters (fried Brussels sprouts and blue cheese chips). I had an outstanding small ribeye steak and Mary raved about her grilled cheese which was made with goat cheese, local Cheddar, avocado, apple wood smoked bacon and apricot bear jam. I'm not used to planning travel for a larger group and it took more time than I planned, so we cut a couple of things and made one stop in the afternoon, at the Martin and Osa Johnson Safari Museum which is devoted to a couple of motion picture pioneers. Martin returned from a cruise on the Snark with Jack London and toured the vaudeville circuit telling about the trip. He fell in love with the 16 year old Osa and they eloped after just 5 weeks. They purchased early motion picture equipment and traveled to the South Seas to filmed their first movie, Among the Cannibals of the South Pacific, which premiered in 1918. They went on to do many travel movies, write books, have a line of clothes, and do lots of marketing. From the museum we walked a short block to the point that is the starting point of Google Earth in Mac computers, and two doors farther to the old soda fountain at Cardinal Drug Center for ice cream sundaes and sodas. 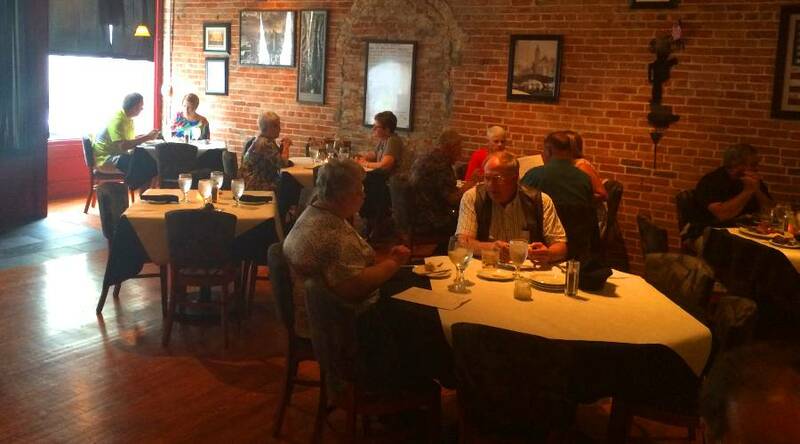 We drove on to Fort Scott where several family members were staying for the night and had supper at Crooners Lounge at the Liberty Theater. It was the first time we had been there (I first heard of it only the day before) and they did a good job with our group of 16. We left our friends at a nearby hotel with other family and drove on to Pittsburg for the night. 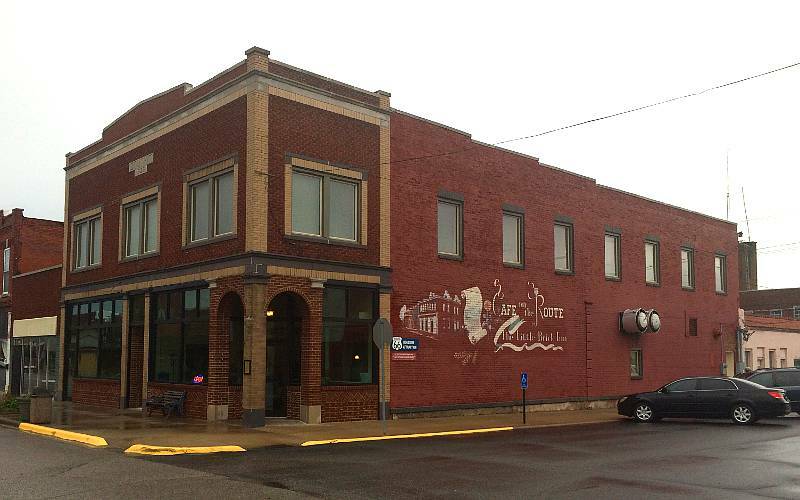 Saturday - May 16, 2015: We drove down to Paola, to have lunch at Beethoven's 9th: The Restaurant. The German restaurant is just off the square. I recently learned that it had changed hands since our last visit and it was time to find out what changes had been made to update the review. The menu and food showed little change since our previous visit. We started with the Sausage sampler (bratwurst, weisswurst, nuernberger bratwurst and knackwurst served with sauerkraut and German mustard). I was pleased that our server told us which meat was which. The first time I ever visited Beethoven's, not only was my server uncertain, so was the second person who she brought over to help. The Jaeger Schnitzel has been my favorite dish here in the past. I still looked the same and was good, but didn't wow me the way it has in the past, though I can't identify the difference. Perhaps it was just an off night. Linda enjoyed her grilled pork chop more. Our serving of bread pudding was huge and looked fabulous, but seemed bland. We didn't come close to finishing it. The biggest change is the Beethoven's is now open Wednesday night, expanding to being open four days a week. Monday - May 18, 2015: I has been two more weeks and I paid my third visit to Crazy Good Eats in Olathe at lunch time. The BBQ restaurant opened at the first of the month. While it has potential, I am not happy with this place so far. The prices are fairly expensive and they are not at all flexible with substitutions. For example, if you don't care for the side(s) that comes with a dish, you must pay full price for a side of French fries. The servings are not very large for their price points and are served on a piece of wax paper on a plastic serving tray, rather than a plate or platter. It makes the serving look even smaller and is just not that pleasant. My favorite dish so far is "Mad Meatballs," a starter made of bacon wrapped meatball, seasoned with their competition rub and glazed with their sauce. It is good, but not very large for $1.75 (3/$4.45, 5/$5.95). Still, this is the dish that will probably bring me back in. I will let this place mature a few more months before trying them again. Friday - May 28, 2015: We left right after work on Friday and headed south on US 69 to the most southeast part of the state. I would have visited a couple of dams near Fort Scott, but it was raining hard as we passed through town. 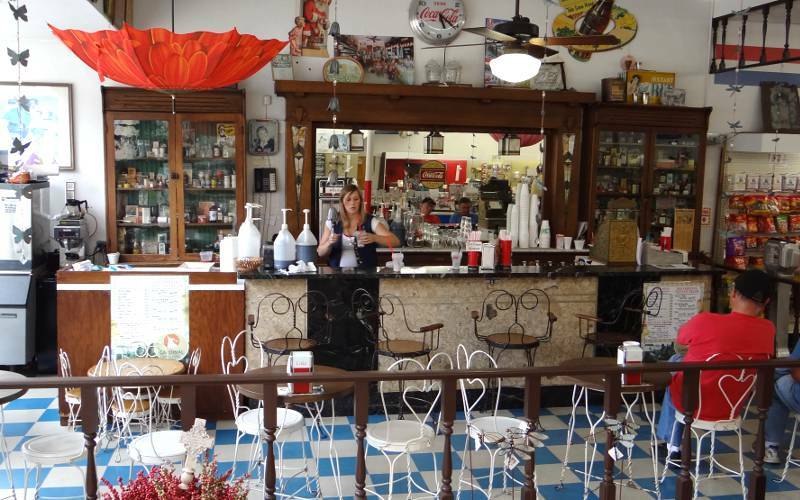 For years, Cafe on the Route in Baxter Springs was a good restaurant with an interesting menu in neat old building on Route 66. Thanks to Diners, Dinettes and Dives, it was nationally known, but it suddenly closed over 2 years ago. New owners purchased it last year and after several months of work, opened with the same name about 6 months ago. At first glimpse the restaurant looks much the same, but they have added a second dining room. The menu is dramatically changed, with the dishes being much simpler now. But the food was well prepared and the prices are very reasonable. The onion straw appetizer was quite good and were the rib eye and salmon, which were the two most expensive items on the menu. The meal came to $37 with tax, but most meals are in the $7-11 range. We spent the night in Coffeyville, making just two stops along the way, one to photograph a beautiful sunset at a flooded river and once to investigate a town which is no more. 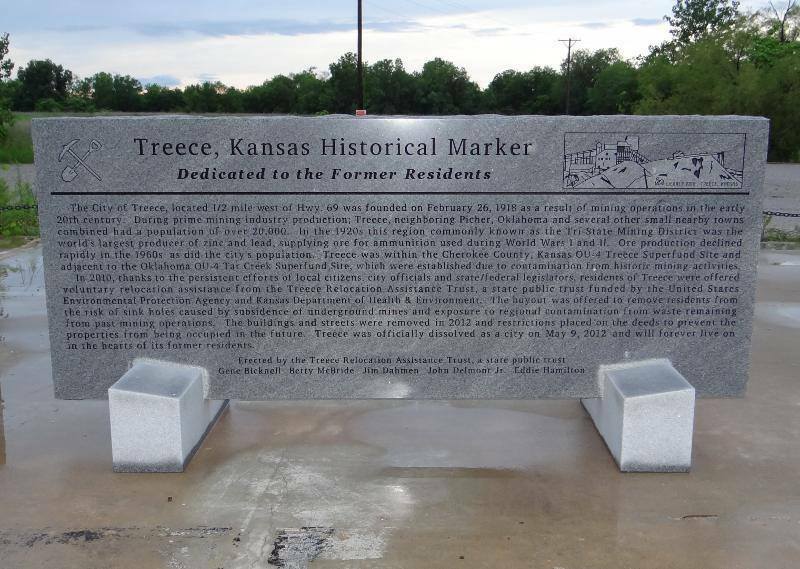 Treece had a population of 138 in 2010, but was abandoned in 2012 and most buildings and other facilities demolished due lead pollution resulting from past mining. Linda spotted a memorial marker for the town and I got photos to use later on Facebook. Saturday - May 28, 2015: This morning was overcast but not rainy. We photographed an interesting abandoned bridge on the way out of Coffeyville and went on to Independence to investigate two small, natural waterfalls and a dam on the Verdigris River. The river was so high that the dam was totally hidden by water, but at least one of the smaller falls will make its way on to our Kansas waterfall list. We went on to revisit three large waterfalls with the high water. The only totally natural falls was Butcher Falls on the Red Buffalo Ranch near Sedan. The 15' drop and the rock banks make this spot pretty spectacular. Cowley Lake Waterfall had changed quite a bit since 2008. A portion of the rock face has broken off and instead of being a straight 25' drop, the water falls about half way, then hits rock and sprays out. It has also become a popular attraction and there are now as many people there at one time as there were all day in the past. My page about the falls is the main promotion the falls has. The other big falls was the one in the spillway of at Eureka Lake, north of Eureka. There was only a trickle when we saw it in 2011, but this time there was so much water that we couldn't even get very close to the falls.